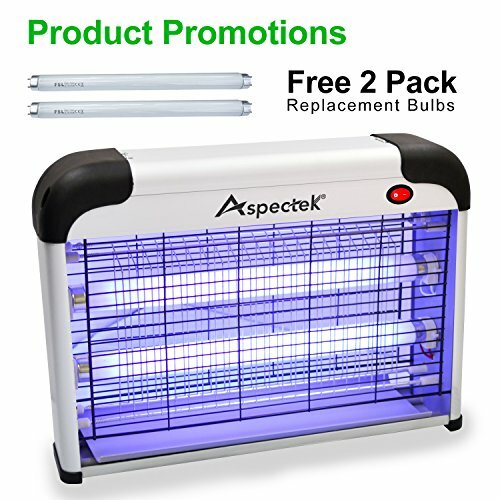 The Aspectek Electronic Insect Killer 20W is the longest-selling indoor electronic insect killer on the market. The Insect Killer simply and easily attracts flies, mosquitos, wasps, and other flying pests, keeping your home free of buzzing. With it's safe design and simple care instructions, the Electronic Insect Killer is perfect for households with families and pets. - When the collecting tray is dirty, switch the device to 'off,' remove the tray, dispose of insects, wash, dry, and replace. POWERFUL INSECT CONTROL: Attracts flies, moths, mosquitoes, and other flying insects using two UV lightbulbs. SAFE: A mesh screen protects you and your family, preventing accidental contact with the electrical grid. CHEMICAL-FREE: Insects are attracted and easily killed by the high voltage metal grids, keeping your home free of chemical sprays. SIMPLE INSTALLATION: Hang the Electronic Indoor Insect Killer by attaching the accompanying chain to the hooks on the top of the unit, or simply set on down on a solid surface. EASY UPKEEP: The removable plastic tray at the bottom of the unit collects dead insect, and is washable to make maintenance fast and simple. The electric grid is self-cleaning. If you have any questions about this product by Aspectek, contact us by completing and submitting the form below. If you are looking for a specif part number, please include it with your message.